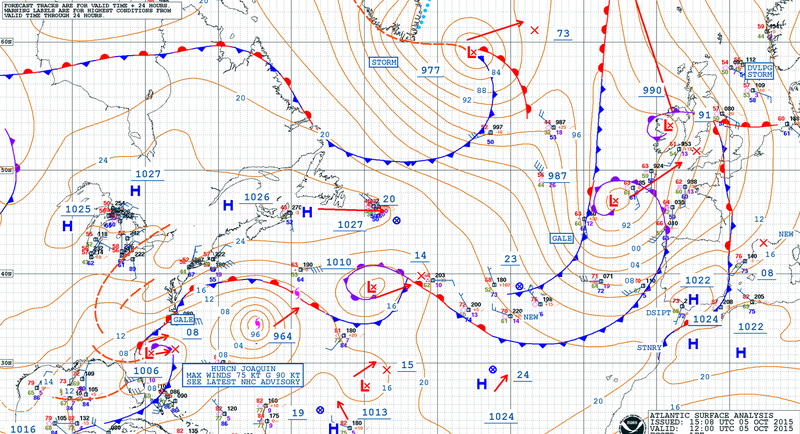 Hurricane Joaquin, previously a Category 4 hurricane, tracked across Bermuda today and dropped to Cat 1. Nevertheless, maximum sustained winds were near 85 mph with higher gusts. Joaquin is expected to transition to a large extra-tropical low pressure system on Wednesday. The chart below shows how many extra-tropical storms (those named previously as tropical cyclones) reach or have got near to the UK, many of these would have passed unnoticed as regular autumnal stormy weather. The tracks below show the remnants of Joaquin apparently taking direct aim at the UK but it’s not unusual to have extra-tropical storms arriving in UK waters during the autumn. Of course, extra-tropical storms lose much of their tropical characteristics and potency as they recurve and track across the cooler mid-latitude Atlantic. Even if extra-tropical storms track directly across the UK they are usually not much more than a nuisance storm, like Bertha in August 2014. Beyond Friday, model tracks are more uncertain on whether the remnants of Joaquin will actually impact the UK at all, or linger offshore. A ridge of high pressure builds later this week and acts as an effective buffer to block off Atlantic LOWS, including Joaquin. He is therefore reduced to sitting offshore. Of the main models the ECM sees ex-Joaquin taking a more direct track across the country later in the weekend. The GFS is keen to disrupt the trough and send a secondary LOW across the south of the UK later in the weekend while the main system seems to merge with a trough to the NW. The UKMET sticks the LOW offshore for longer and sweeps the system to the NW of the UK with any wind impact mostly limited to the far west. This disagreement between models shows uncertainty so … keep watching forecasts if weekend weather (especially later) is important. 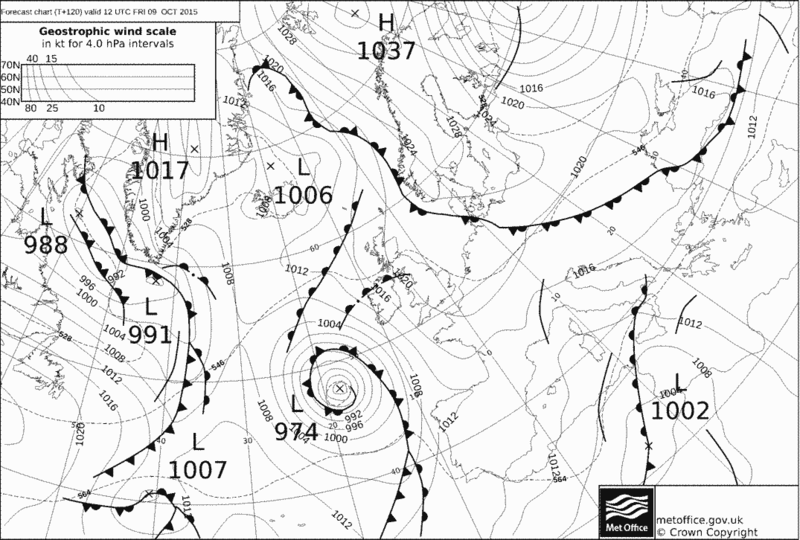 Prior to this the pressure across the country is set to build after an unsettled start to the week. 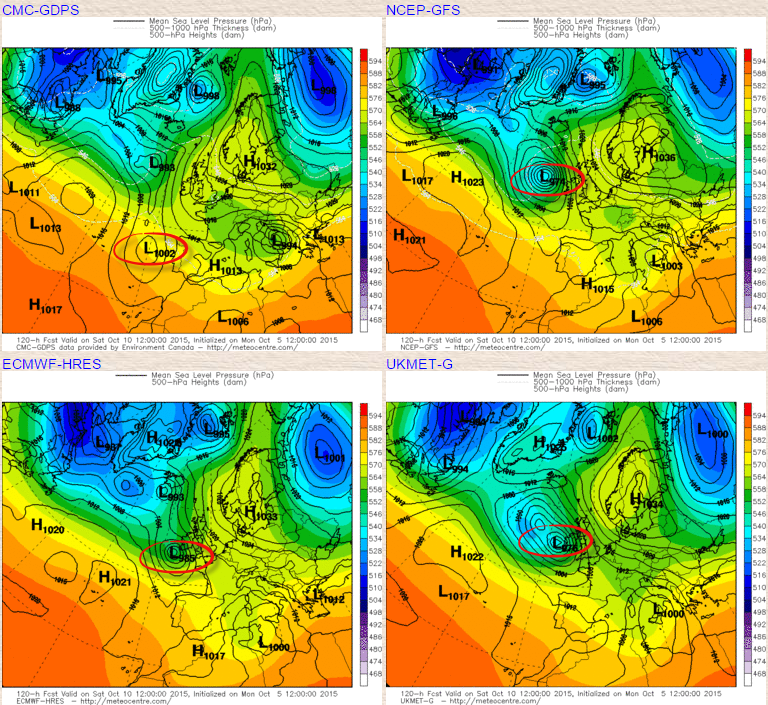 The charts below show a purposeful rise in pressure to the end of the week, with the Joaquin uncertainty kicking in thereafter, although Saturday looks good on most charts at present. 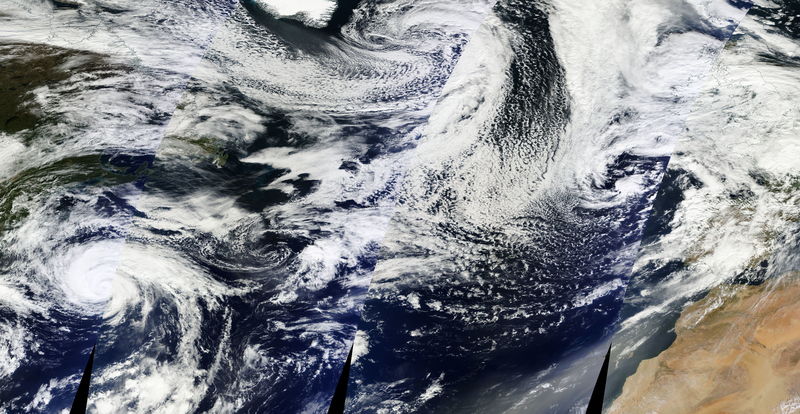 The Atlantic satellite view shows the impressive swirl of Hurricane Joaquin tracking near Bermuda today and the UK top right.